Betsafe officially launched in 2006 has has since established itself as one of the most trusted and reliable gaming companies in the world, one with more than 450,000 customers across more than 100 different countries. Betsafe's poker client is part of the busy MPN network, which means you'll have plentiful cash game and tournaments to choose from around the clock. Getting your hands on a bonus of between €25 and €1,000 at Betsafe is easy. So easy that you could be up and running in a matter of minutes. Download Betsafe via PokerNews, register an account with Betsafe and choose your poker alias. Once you have completed these steps, go to the tab "available bonuses" in the top right corner of Betsafe and activate your bonus by entering the bonus code of your choice. You must do this within 30 days of creating your Betsafe account. All you need to do then is play real money cash games or tournaments to earn loyalty points; these are earned at a rate of 10 Loyalty Points per €1 paid in rake or tournament fees. Check out the table below to see your choice of bonuses. Please be aware that the bonus codes must be entered in capital letters and they expire after 60-days of being activated. Any bonus not released after 60-days is forfeited. As a new Betsafe player, you gain access to some tournaments that are only open to Betsafe players who have registered their accounts within the previous six weeks. Every Wednesday at 2:00 p.m. CET is a €388 New Player Freeroll with a €1,000 New Player Freeroll taking place on Wednesday at 7:00 p.m. CET. At 9:00 p.m. CET, there is a €500 guaranteed New Player Turbo tournament that only costs €1.10 to enter. You earn loyalty points while playing real money poker games at Betsafe and these points are not only used to release your welcome bonus, they are also used to determine your VIP level. The higher up the VIP ladder you climb, the more money you receive when exchanging your loyalty points. Being a new Betsafe customer gives you the chance to play in the 10 Day 10 Achievement Challenge. Not only does this promotion help you navigate your way around Betsafe's software and products, it rewards you for doing so. Start the 10 Achievement challenge in your account then complete the following challenges within 10 days. 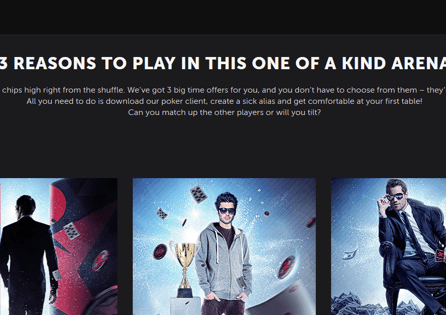 Betsafe has jackpot sit & go tournaments on its site known as Fish Party tournaments. When the leaderboards run in two-week spells, players with the most points at the end of the fortnight win a share of €3,500 worth of Fish Party tickets. Play €1 Fish party games to qualify for the Low Leaderboard where 100 players share €500 worth of tickets. Enter €5 and €10 Fish Party tournaments to qualify for the Medium Leaderboard where the top 80 finishers share €1,500 worth of tickets. Finally, play in €20 and €50 buy-in Fish Party games and if you are one of the top 25 points earners you win a share of €1,500 worth of tickets. Betsafe has a Bad Beat Jackpot that is triggered when four-of-a-kind deuces (twos) are beaten at showdown when both the winning hand and losing hand uses both of their hole cards. The hand must be played in Hold'em with stakes of at least €0.10/€0.20 and both players must have opted into the Bad Beat Jackpot before the hand is dealt. Betsafe's excellent customer support team can be reached around the clock by sending an email to support-en@betsafe.com. Before contacting customer support, you can probably solve your own query by heading to the extensive FAQ section of the Betsafe website.